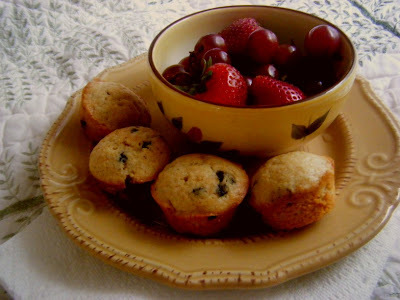 Enjoying this pretty little breakfast my mom just brought in, propped up in the iron bed that was mine as a girl, surrounded by reminders of my youth...I am, at long last, ready to return to my little blog. I wouldn't call the last several months a "dry" period. I haven't been writing a lot, but our home has been happy and lots of jewelry has been coming out of the studio. Still, I feel this slow deterioration of the deep-rooted peace that lets me know things are in balance. I realized a few weeks back that neglecting the discipline of journaling was taking its toll on me. Writing helps me stay focused, centered, and sane! Returning to my blog is part of my plan to get back on track. I have also taken up the habit of writing morning pages. Morning pages, a long-time practice and teaching of artist, author and mentor, Julia Cameron, are three pages of writing (long hand) anything that comes to your head. In her classic book, The Artist's Way, Cameron suggests that artists do this every day to awaken creativity. (Click here to read more about morning pages.) For me this type of journaling is a form of prayer. I come just as I am, pour out whatever is in my heart and mind, and I listen. I get answers. I gain clarity. 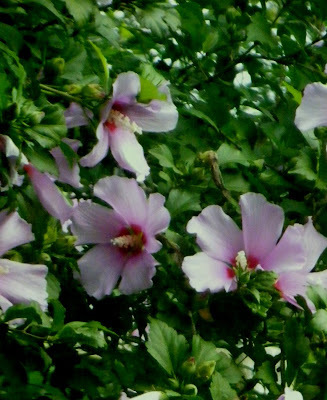 And today, I was inspired as I wrote and looked up to see this amazing Rose of Sharon blooming outside the window of my parents back bedroom. It is good to spend time in the home where I grew up. So often when I come to visit I am rushed... here for a weekend, or here for an event. But this week I am just "here". I have time to rest in this place so filled with memories. I have time to remember and honor much of what made me who I am. It is bittersweet. I look out at the Rose of Sharon, so generously offering its gorgeous bouquet and I marvel at how large this plant is now. I remember when it was tiny. Come to think of it, I remember when it wasn't there at all. I look out into the yard and remember plastic swimming pools, our big swing set, birthday celebrations, and lazy summer mornings just like this when everything was right in my little world. My biggest worry was what game my little sister and I would play when the afternoon heat drove us inside for the day. I find myself wishing our old playhouse was still out back, with it's big windows and adjacent sandbox. Maybe I'd build a few sand pies for our imaginary bakery or maybe I'd just sit and dig my toes deep into the soothing cool of the sand. Maybe there, surrounded by so many memories, I'd hear, loud and clear, the laughter of a little girl who knows she is loved and believes anything is possible. I hope you make time today to remember and honor something good from your past. Allow these memories to lift and encourage your spirit as you close your eyes, dig in deep, and listen. there are so many memories at that house. It always fill me with such a warmth whenever I step foot into it. So why not build yourself a playhouse in the woods? You deserve it. I think a lot about building a studio in the woods. I wonder if I'd get creeped out at night? You know, after writing this post I realized what a rare privilege it is to be able to visit the home of my childhood. It is truly a blessing I don't want to take for granted.